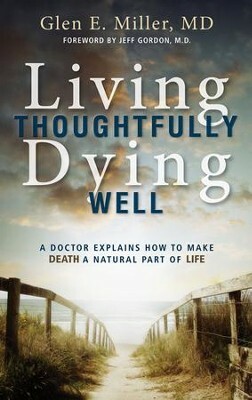 As a healthcare worker and more importantly as part of humanity, I was struck by Glen E. Miller MD’s very personal and powerful book entitled Living Thoughtfully, Dying Well: A Doctor Explains How To Make Death A Natural Part Of Life. A book that is written particularly for the elderly or chronically ill and their families, it is full of helpful advice and practical steps to prepare for a “good death”. In an age where “70 % of patients say they want to die at home, yet only 40% do so”, the author places a lot of emphasis on the importance of intentionality in preparing for a successful transition to the next life. Within the book the author includes thought provoking exercises for reflection, links to on line resources, and other helpful charts and checklists; including the one he himself created and used in order to be well prepared for his own good death. (1) As a physician, I cared for dying patients. (2) As a hospital administrator and author of a book on the subject, I understand the workings of the healthcare system. (3) As a patient, I experienced the need to make far-reaching and urgent medical decisions under the stress of uncertainty and time limitations. (4) With a degree in theology, I recognize dying as a spiritual event- more so than a physical, emotional, social or psychological one. This book addresses practical concerns, such as creating Advanced Directives and appointing a Power of Attorney for Health Care Decisions, without neglecting the essentials of being spiritually and relationally prepared for a good death. Personal reflections of the author, who himself is anticipating the end of his life due to his failing cardiac health, as well as numerous stories and conversations that he relays throughout the book, make it a honest and intimate reading experience. It is a resource which is equally as useful for personal reflection as it would be for group teaching and discussion. I highly recommend this book as essential reading for all who have come to an awareness of their own mortality. Miller, Living Thoughtfully, Dying Well, 135.